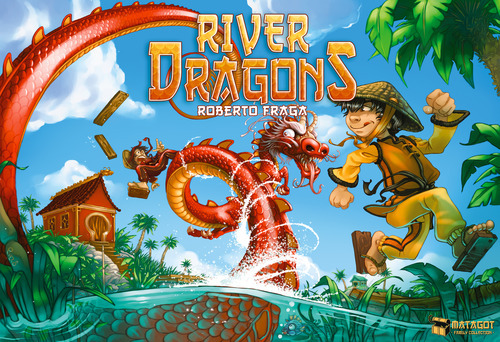 River Dragons is a reprint of the 2012 release also called River Dragons which itself was a re-invention of the 2000 game Dragon Delta. 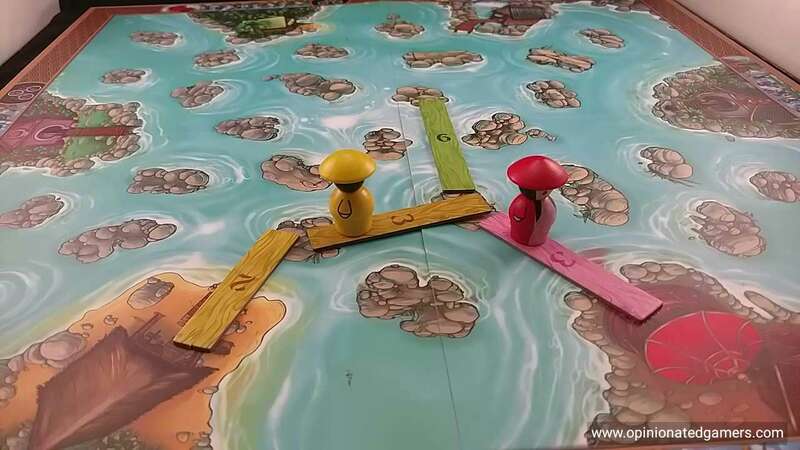 In this game, players vie to be the first one to cross the Mekong delta by building bridges and traversing the waterway. At the start of the game, each player chooses a starting village – there is a helpful player aid located just beneath each island which tells you where to start for each player count, a reminder of your color and where your destination island is. 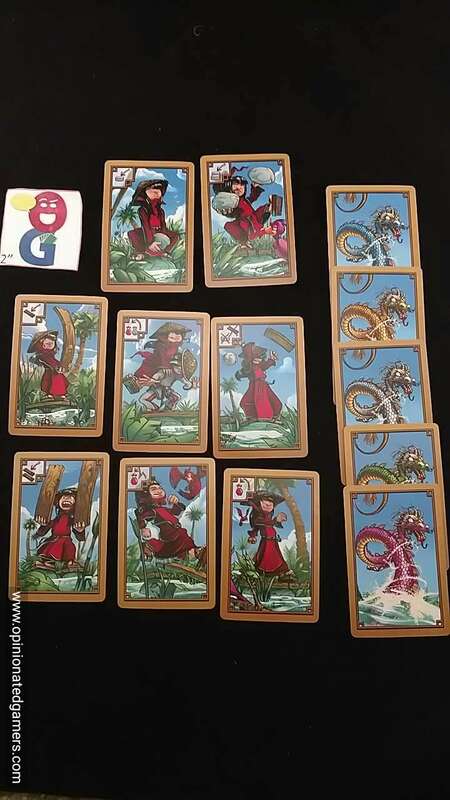 Each player also takes the pawn matching his color, the six planks of his color and a deck of 13 action cards – from which he removes all Dragon cards of colors not in the game. The game is played in a number of rounds – first players have a programming phase where they look at all of their available cards and then choose five of them to play. They are placed face down on the table in order. Then, once all the cards have been laid out, each player flips over their first (leftmost) card and each player executes their action starting with the start player for the round and going clockwise around the table. This continues for all 5 cards. Then the start player moves one position to the left and the process continues. The game ends immediately when any player is able to reach his stated destination village. So, what are the possible cards? Place 1 stone – place a stone (i.e. small wooden disc) on any of the islands printed on the board. The wooden disc must lie completely on the graphic of the island. Each island can only have one stone. Place 2 stones – place two stones, one each on two different islands. Place 1 plank – a plank is placed on the board supported by two stone or a village and a stone. Before the action happens, you must choose one of your six planks – and once chosen, you cannot change your mind! You are not allowed to pre-measure or test. You can only look at the board and then you have to choose. Once you choose a plank, you must place it on the board if possible. If it is too long for a connection, that is OK, it will simply overhang the stones. If it is too short for any possible connection, it is discarded from the game. You may not move a stone while placing a plank. Any given stone can only support 3 planks. A plank may never rest on another plank unless there is a stone underneath the place where they touch. Remove 1 plank or 1 stone – you can remove any plank from the board and add it to your personal reserve – you will be able to play this plank on a later turn OR you can remove any one stone from the board and return it to the supply. However, you cannot remove a plank which has a pawn on it. You also cannot have two planks of the same size in your supply nor have more than two colors of planks in your supply. You also cannot remove a stone if it is already supporting a plank. Move once – move your pawn onto an available adjacent plank or village. You can move in any direction and you may move onto any color plank so long as it is not occupied by another pawn – any number of pawns can be in a village. If there is not a legal move, you must go back to your starting village. Move twice – same as above but twice. It is possible here to end up on the same space as you started. Jump over another pawn – You must be able to jump over a plank occupied by another pawn and then onto an empty plank adjacent to that one. If this is not a legal play, you return to your starting village. River Dragon – before any actions are done in a round, check to see if any Dragons have been played. A dragon card has a specific opponent color on it, and for that round, the card of the player with the targeted color is nullified in the same position. i.e. if I play my green Dragon in the first slot, the Green player’s card in canceled in the first position. The only exception here is that a Dragon card cannot cancel another Dragon card – in this case, all Dragon effects are applied. The game is at heart a programming game. One of the features that I like about it is that you have the full complement of action cards available to you in each programming phase. The game is as much about reading your opponent’s minds as it is furthering your own goals. As you would likely expect with games with secret and simultaneous selection, the resolution of cards can be quite capricious. You never know what to expect until you see the cards! If you’re not OK with chaos in your games, this is definitely not the game for you. The idea of the game itself is simple – be the first to get from Point A to Point B. It gets complicated though as all the paths are forced to cross in the middle. This is key to the game as there are restrictions which limit the number of planks each stone can support as well as a prohibition on planks bisecting previously laid planks. As the plank network is being built, the previously played planks begin to form barriers which cannot be crossed by other planks, so players must find alternate methods in which to traverse the river OR they must spend time removing the offending planks in order to allow paths to be placed in new directions. The game can be surprisingly nasty. Once a player looks to be in a good position, it’s not uncommon for the table to gang up against that perceived leader. A dragon or two may be played against him or maybe a plank is his path is removed… Even if you’re not the leader, sometimes your plans can be upset by a seemingly random Dragon card played against you that disrupts your planned flow or someone plays a plank earlier in the round that doesn’t let you move in the direction that you want to go. So, you have to spend efforts trying to read your opponent’s mind – it is very much a psychological game. You could try to guess what they’re doing, and then play your cards in a way to prevent them. Or, if you think that your opponents are trying to stop you, you might play your cards in a different sequence or develop some redundancy in your planning. For instance, if you really want to place a plank, you might play you “Play 1 Plank” card and then follow it up with a “Play 2 Planks” card – in that way, even if one card is stopped by a Dragon, hopefully, you’ll get the other one through. The game definitely rewards bold plays – though there is a high amount of risk with it. The game can often be won with a well timed “Jump over another pawn” card, but the risk of this play is that if you fail – you must go all the way back to your home village! Similarly, you can try to place two planks to get your desired route on the board, but if you choose the wrong planks or your building sites are taken away, you may lose the planks forever or be forced to place them in less desirable places. I did not have a copy of the intermediate 2012 release, but I had played the original version of Dragon Delta many times when it first came out. 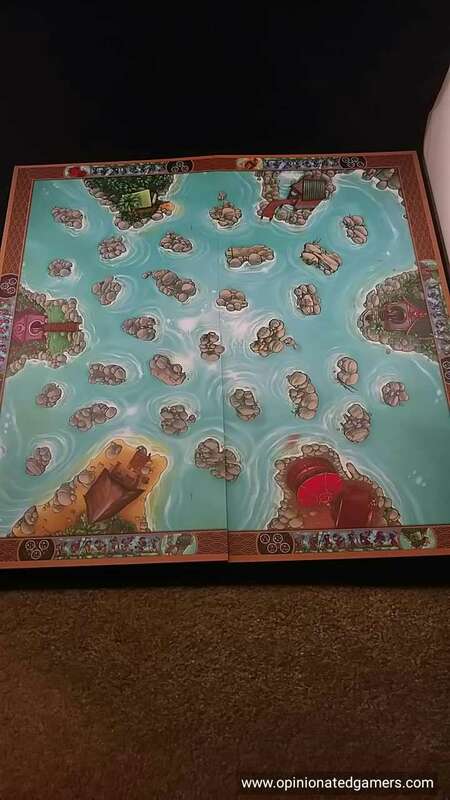 This 2017 version does have a double sided board – one side littered with stones on which to build bridges, the other side is an open water surface allowing players to place stones where they want. 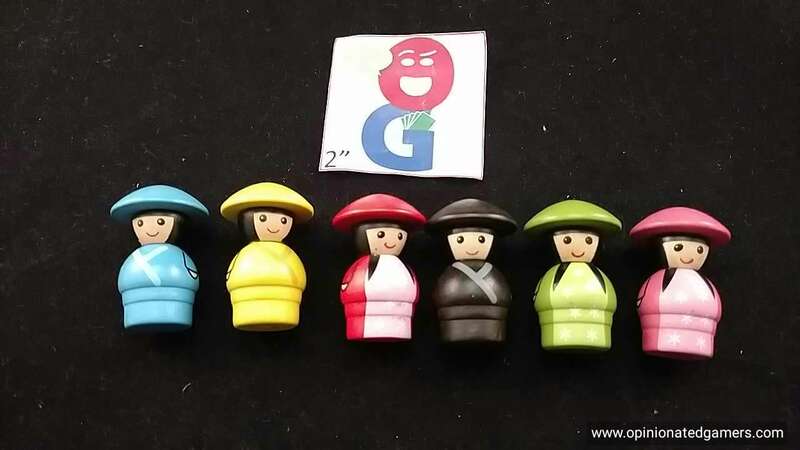 The meeples are also upgraded to a larger and more animated caricature of Vietnamese children. From looking on the Internet, the component appear to be the same as the 2012 version. One caveat that remains from the original version is that the balance of the planks and meeples is not great. The group must be careful to not jostle the table, and all sleeves need to be pushed back to their elbows or else there could be a “sleeve tidal-wave”. While there is no specific penalty if the planks or meeples are dislodged, it can be a pain to have to re-build the board if it falls apart. I have found that the game works best with 4 or more players. River Dragons needs the other players in the game to provide the needed chaos and competition that makes the game shine. Interestingly, the rules suggest that you should play the game “several times with only 2” players, but I think that this could end up turning players off from the game because it’s honestly not much fun with two. This is one of those rare cases where I would advise not heeding the publisher’s instructions and diving right into the multi-player game.